The track here in Washougal is always tricky due to very slippery soil and the shadows cast by the big fir trees that are everywhere, but today could be even trickier. Thursday saw quite a bit of rain come down, and although the only visible evidence are some muddy places in spectator areas, the track has more moisture in it than normal, and it developed a lot of ruts just a few minutes into the first practice of the day. The different conditions could make for some interesting racing here in the Pacific Northwest. In the first 450 practice JGR Toyota Yamaha’s Josh Grant was fastest with a 2:16.412, and Eli Tomac followed just over half a second behind with a 2:17.155. Tomac, who shadowed Ken Roczen briefly, seemed like he was doing more learning than charging and he only threw down one fast lap. In fact, his second fastest lap was 2:26.204. In other 450 news, James Stewart isn’t here today after reports of dizziness before the second moto last week at Spring Creek. The second 450 practice didn’t go as well for Grant, who looked like he cross-rutted right as he went off the jump at the base of Horsepower Hill, the longest and fastest climb on the track. He got separated from his bike and he slammed down hard, tumbling several times. To add insult to injury, his bouncing bike smacked into him as he was coming to rest, and Justin Brayton narrowly avoided plowing into him. We checked on his status but his team wasn’t sure if he’d be able to race or not. When the session ended it was Ryan Dungey who had claimed the fastest time. Behind him Trey Canard, Eli Tomac and Ken Roczen were only separated by about half a second. Credit to Ryan Sipes, local hero Tommy Weeck and Ben LaMay for getting inside the top ten. If you wanted an exciting race for the win, this wasn't the one to watch, as Ryan Dungey checked out on the first lap and took the win by a mile. Behind him however, things were a bit more interesting. Ken Roczen started in about fifth or sixth, but it wasn't long before he'd moved past Trey Canard and into second. One lap later a charging Eli Tomac, who had gotten a lousy start but was charging through the pack, followed suit and went after Roczen. Roczen was able to stabilize the gap for a little while, but Tomac wouldn't be denied and finally made the pass in the whoops before the finish line for second. Elsewhere, they were pretty spread out. Brett Metcalfe made a late charge for fourth on Trey Canard, but Canard was able to hold on. Fredrik Noren also tried to initiate a battle with Peick, but something happened out of view that caused Noren to lose a few seconds. Speaking of Peick, he was able to put the moves on Justin Brayton late in the race to take seventh behind Andrew Short. Justin Brayton busted out another holeshot in moto two but just like in the first moto it was Ryan Dungey who quickly took over the lead. Eli Tomac took over second soon after and for a while it looked as though he might be able to run Dungey down to steal the overall. But Dungey was just too strong and steadily cranked out a lead on Tomac, which at one point was over ten seconds. Tomac was the man last week, but today Dungey was just untouchable. And Roczen? He started just inside the top ten, and while he got into third relatively quickly he wasn’t able to make up any ground on Tomac, who took second over Roczen by nearly a minute. A few positions back in the pack the battle that nearly happened between Weston Peick and Fredrik Noren in the first moto materialized in the second, with Peick getting the spot. Still, Noren has got to be pumped to finish seventh in the moto, a career best. Trey Canard had a good and bad moto. He went down early and had to wait for everyone to go by before he was able to retrieve his bike and get going again way, way back. That’s the bad news. The good news is that he was able to recover and come back to eleventh. Another good ride came from the Tommy’s, both Weeck and Hahn. Weeck took ninth and Hahn took tenth. Chad Reed was inside the top ten in this moto but ended up pulling off. Not sure yet what happened but a couple times it looked like he was holding his back. In 250 action it was Red Bull KTM’s Marvin Musquin who topped the first practice. In fact, with a 2:16.035, he was even faster than all of the 450s. Same with Jeremy Martin, who was a close second with a 2:16.174. In the second session Musquin was fastest again, bettering his time on a broken-in track by roughly two seconds. The second 250 session saw another Yamaha rider, Anthony Rodriguez, go down in the same spot as Josh Grant. His team says he hit his head and will sit out for today. Christophe Pourcel got this moto going with a holeshot, but when Jeremy Martin quickly passed into the lead it appeared as though the race for the win would be a snooze. But Red Bull KTM's Marvin Musquin had other plans and refused to let him check out and was able to eventually pass into the lead on lap five. That triggered a bit of a backward slide for Martin, who got eaten up by Pourcel, Jason Anderson and Blake Baggett. Anderson and Baggett were both flying in this moto but unfortunately both had crashes. Anderson's crash was a big one and forced a DNF, while Baggett's came when he was all over Pourcel for second. It wasn't a huge crash, but he did lose a few spots. Cooper Webb had a good moto after a mediocre start, and when it was all over he'd made up tons of ground on the lead group to take third from his teammate Jeremy Marin. Musquin would go on to take the win by a large margin over fellow Frenchman Pourcel. Christophe Pourcel yanked another holeshot to get the final moto of the day going but Justin Bogle immediately took the lead. Back in fourth was Musquin, but he was on the move and it didn’t take long for him to get by Baggett and Pourcel. He then went after Bogle and absolutely railed an outside corner and dove to the inside of the next turn to nip Bogle. It was beautiful. After the moto ended Baggett said, “Marvin was on it today, I had nothing for him.” It wasn’t just Baggett though, nobody had anything for Musquin and he went on to win the moto for a perfect 1-1 day. The other Frenchman, Christophe Pourcel, had a terrible moto. After Musquin passed him he started falling back rapidly, with Musquin actually lapping him near the end of the race. When he finally crossed the line he’d slid all the way back to fifteenth after taking second in the first moto. The stage was set for Baggett and Bogle to battle it out for second, but when Baggett was getting close Bogle had a little tip over and surrendered the spot without a fight. Credit to Bogle for getting going quickly and not losing any further spots in the incident. Jeremy Martin and Cooper Webb overcame less than stellar starts to take fourth and fifth. Joey Savatgy and Alex Martin had great performances in this moto, going seventh and eighth. 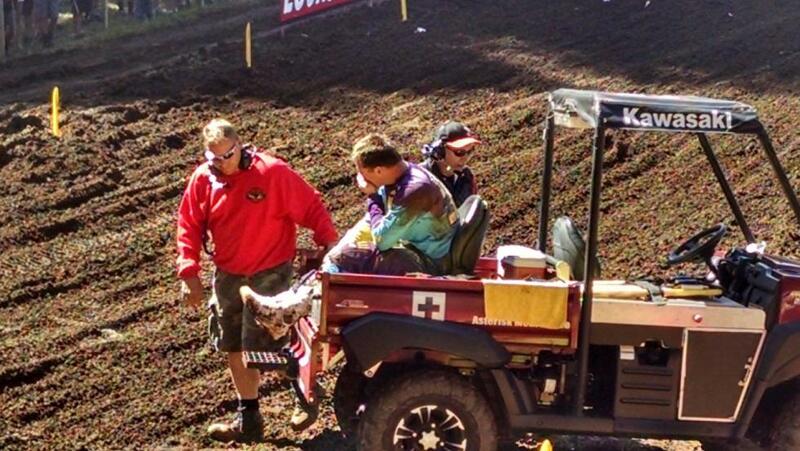 Although in obvious pain, Josh Grant still tossed his gloves to the crowd on his way back to the pits.